Getting a flat tire can occur anywhere, either on the highway or in the middle of nowhere. Regardless of where you are stranded, this guide should help you get back on the road as quickly and safely as possible. Make sure the car is off the road, drive on the rim if needed a few feet to get to a safer location. Place the car in park, turn off the engine, lock the emergency brake. With the lug wrench, loosen the lugs a turn while the tire still touches the ground. Jack the car into the air until the flat tire clears the road surface, now loosen all those lug nuts all the way. 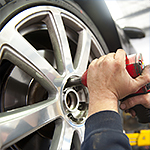 Remove the lugs, carefully take off the flat tire, replace with the spare tire, replace the lugs hand tight, lower the car. Now tighten all the lug nuts tightly. Keep up with your tire rotation appointments at Volvo Cars Princeton so we can identify any tread issues before you get a flat tire.